Ingredients: drinking water, apple concentrated juice, concentrated grape juice. Nutritional value of 100g of the product: proteins – 0.4 g, carbohydrates – 11.0 g.
Energy value (caloric content) 100g of product – 46 kcal. 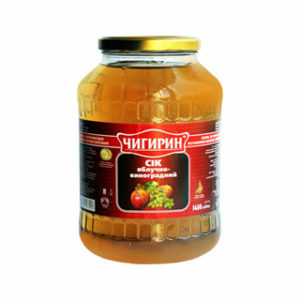 Vitamins: B1 – 0.01, PP – 0.05. Shelf life at storage at temperature from 0 to 25°С and relative humidity no more than 75% – 2 years.